Most of you are probably already thinking about the summer holidays. When it comes down to holidays, we all love to dream about it all year long. But how to make your summer memorable? 1. YOU WILL HAVE A SUNNY AND HOT SUMMER! As you know our school is located in the heart of Lisbon and ...well, Lisbon is simply amazing. Even more during the summer: one of the sunniest cities of Europe, the average temperature is 24 ºC and its already unique light is even more magical in July. 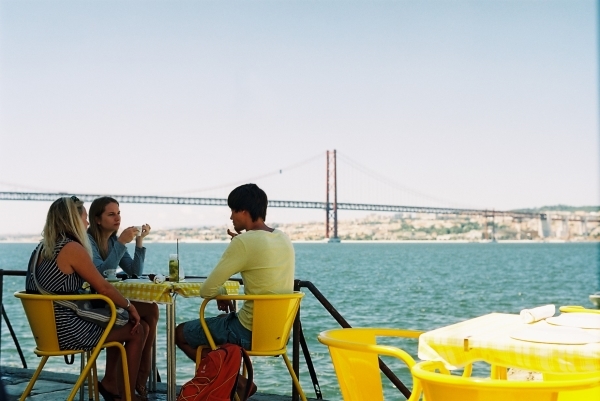 Lisbon is really famous for its proximity to stunning beaches where you can enjoy the breeze coming from the Ocean, for its breathtaking viewpoints over the Tagus river where you can drink a fresh beer and its amazing music festivals held in beautiful parks where to lay and wait for the sunset. 4 weeks of full immersion for a total of 80 hours Intensive Group Classes. Our groups are very small (maximum 9 students) and our teachers are very experienced and passionate about what they do meaning we guarantee quality. We have three different levels: A1, A2 and B1. Enhance your speaking, writing, listening and grammar skills while having a great moment! You'll come back home from your holidays speaking portuguese, that's a fact! We features fun and exciting activities after classes and during the weekend: half-day trips around Lisbon, gastronomy tours and afternoon/evening activities to experience more of Lisbon, such as visiting stunning beaches, discovering the magical Sintra, tasting wines and doing a boat trip observing dolphins. You won't get bored and will master the portuguese culture! We will do it for you! We know how hard it can be to find a central room with all comforts during high season, especially when you are abroad and you don't speak the language. This is why we will take care of everything. We will work along with our partners in order to provide you with the best accommodation during your stay: a private room in a shared apartment and in a central area of Lisbon so that you can enjoy everything this amazing city has to offer, easily. Every year we receive hundreds of students from all over the world and there is nothing more enriching that a cultural exchange like this. You will not only learn about the portuguese culture, you will also learn about different cultures and different points of view. You'll create special bonds with your classmates. Don't forget it: friendship makes people happier and healthier. A good way to spend a summer! Plans for summer 2016: learning portuguese in Lisbon with Portuguese Connection! What else?